The energetic neutral atom beam lithography and epitaxy (ENABLE) capability represents a controlled method for clean and selective introduction of heteroatom dopants into a variety of substrates, including highly graphitic 2D structures. ENABLE utilizes a unique high-intensity source for producing energetic reactive neutral atomic species that allow direct chemical bond activation by overcoming high thermal barriers. The technique involves a neutral atom source connected to a UHV thin-film growth chamber. The reactive atomic species are generated by seeding diatomic molecules, e.g., N2 and O2, into a high-density, high-temperature plasma containing mostly UHP argon and sustained by a continuous wave infrared laser. The plasma is steered through an outlet nozzle and a series of apertures to create a beam of energetic neutral nitrogen (or oxygen) atoms that is then directed towards a substrate holder in the growth chamber. Samples are placed on the heated holder by a load-lock system. Two sources for in-situ diagnostics exist within the main chamber: a residual gas analyzer (RGA) and a reflection high energy electron diffraction system (RHEED). The RHEED system is useful for characterizing the epitaxial and crystalline nature and growth modes of the thin films and substrates. The residual gas analyzer measures partial pressures of the molecular masses in the chamber. By tracking these masses versus time it is possible to detect changes in the sample surface chemistry as film growth or surface functionalization occurs. A third diagnostic tool coupled to ENABLE, time-of-flight mass spectroscopy, is used to directly measure the composition and kinetic energy of the species in the energetic beam. Capability Bounds: Currently, the ENABLE capability allows doping of the line-of-sight surfaces of substrates up to 10 cm in diameter. Other tools in the ENABLE system allow co-deposition of a variety of other materials, mostly metals (e.g., Fe, Mn), using six thermal and e-beam evaporators to grow semiconducting materials with controlled surface functionality. 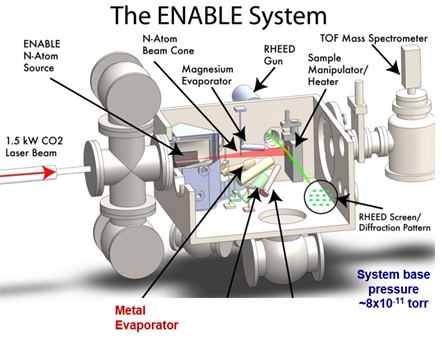 Unique Aspects: Designed and built at LANL, the ENABLE capability allows numerous adjustments to be made in tunable parameters, including neutral atom beam energy, substrate temperature, exposure time, and co-evaporation of dopants. These parameters provide extensive abilities for selective introduction of dopants and/or defect sites for improved electrocatalysts. U. Martinez, T. Williamson, K. Artyushkova, N. Mack, G. Purdy, J. Dumont, D. Kelly, W. Gao, A. Dattelbaum, A. Mohite, G. Gupta, P. Zelenay, “Thin-film non-precious metal model catalysts for oxygen reduction reaction,” ECS Trans., 64, 293 (2014). E. Akhadov, D. Read, A. Mueller, J. Murray, M. Hoffbauer, “Innovative approach to nanoscale device fabrication and low-temperature nitride film growth,” J. Vac. Sci. Technol. B, 23, 3116 (2005). Benefit: Doping of materials causes distortions and alterations that inevitably change their thermal, electronic, chemical and mechanical properties. Depending on the specific type of defect introduced, new properties can arise that can benefit certain applications, including electrocatalysts. Controlled heteroatom doping provides the means to tailor interfaces and defects to achieve new levels of performance in PGM-free catalysts.